As a celebration for Valentine’s Day, on Thursday, February 7, Greenwich Art Society Studio School teacher and mixed media specialist, Ellen Gordon, will teach you a fun painting method from 5:30-7 p.m. at the Greenwich Art Society (3rdfloor studio). 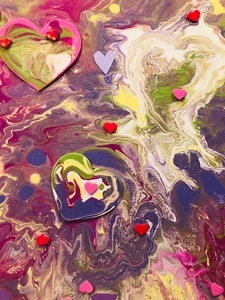 You will learn the hottest DYI painting method for Valentine’s Day but with a fun and exciting twist of adding collage elements to your painting. No experience required and all supplies provided. Each painter will create a one of a kind masterpiece. Bring your friends, meet new people and have some fun creating special Valentine’s Wall Art for your home and loved ones. Founded in 1912, the Greenwich Art Society is the oldest visual arts organization in Greenwich, Connecticut. The society’s Studio School offers classes by professional artists, providing traditional and foundational visual arts education for children and adults.